I have to admit, usually when I think of official iPod apps, I think of more or less worthless, overpriced tripe that I don’t want. But this horribly biased opinion is actually untrue, and I was more then happy to change my tune when I came across the Pandora app for the iPod Touch, and even more chagrined when I came to find out that this awesome little program is free. You may be wondering what it is about the Pandora that made me change my overly cynical tune. Well, what this nifty little program does is set up free stations based on your favorite artists, as well as similar artists, and streams them to your phone. The sound is nice and clear, and neither the program, or the great music, cost you a penny. It also works with both the iPod Touch, and the first generation iPhone, so you won’t have to miss out. When I first heard about it, I was skeptical. After all, so many apps like these promise a truly customized experience, with a huge amount of song choices, but once you try it out you find a total of 50 songs from one genre, or stations that are so random they must be sent out to everyone. Which is why I was so happy when I tried Pandora out and found that they have a huge selection of music, including some lesser known artists I love (I actually let out a cry of happiness when I found that they offered Poe through their site). Another great feature is the ability to share or email your station to another Pandora user, which is great if you feel like rubbing your fantastic taste in music in a friend’s face, or just know someone who is into the same artists you are. You can also check out their ‘Pandora Video Series’, with some cool little documentaries. 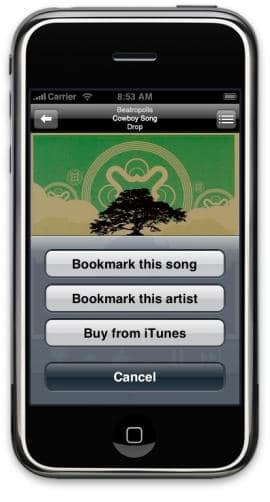 To get the Pandora app for the iPhone or iPod Touch, go to their official website http://www.pandora.com/, or visit the official App Store. Installing is easy, and there is a detailed FAQ that tells you everything you could possibly want to know about how to work the Pandora. This is probably the best official application I have seen for the iPod Touch, and I haven’t been able to stop listening to music since I downloaded Pandora. Not only is the sound crystal clear, but the radio stations it put together for me are incredible, and only seem to give me just what I like to hear. Check it out today, and find out why the Pandora app for the iPod is one of the most popular items coming out of the App Store.